Oh it is very sad and tragic, but a movie well worth your time. 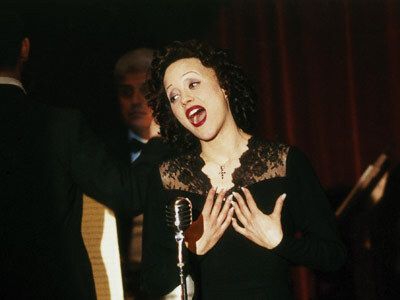 In particular to see Marion Cotillard completely transform into Piaf. You are right, Vinnieh, about the back-and-forth narrative hindering the overall enjoyment of the film, but it’s so artfully done by Cotillard–wow, what a performance! No one could have played Édith better. I thought the approach was a bit distracting, but it at least presented things differently. And Cotillard became Piaf. Now you are talking my language, V! As a lifelong fan of Piaf, I was a little concerned how this would play, but I needn’t have worried. 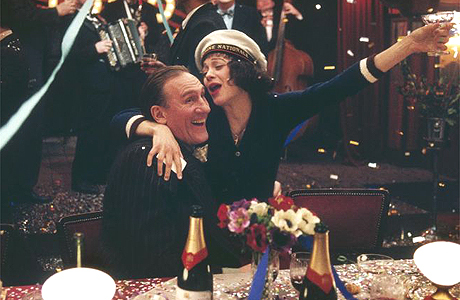 One of the best-ever biopics, and a simply amazing performance from Cotillard. The period feel, the clothes, styles, and make up. All flawless. One of my favourite films ever, and no gripes from me about the construction either. I thought it was refreshing and original. Something we could do with a lot more of, in these days of lame remakes and comic-character franchises. This film gets a 10/10 from me, in every way possible. The structure was the only thing that made it a bit distracting and really my only foible. All the rest was superb, the lighting was gorgeous and evocative, mirroring the brimming talent and tragedy of Piaf. And Marion Cotillard turns in an immersive performance that is towering in every way. 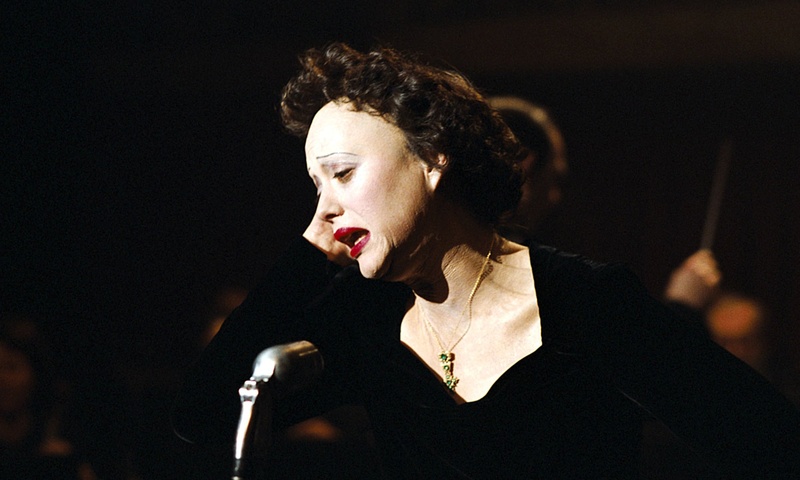 Was so amazed at her transformation into Piaf, quite simply breathtaking and deserving of the Oscar. You got that right mate! rarely has an Oscar been so well deserved. She won a slew of awards for her role and all of them were thoroughly merited. I adore this movie, it’s a hard one to see through but once you do its worthwhile. Yes it was painful and mournful, but well worth the watch. Especially for that spellbinding performance from Marion Cotillard. She had a roller coaster of a life. Often up and then down in quick succession. Yes when she didn’t have money to bury her child she became a prostitute to pay for a funeral and the catholic church would not bury her child. At least that is what I had heard from a friend years ago. I hadn’t heard that before. She really had a tragic life. I will look it up or call my friend that told me this. In February 1933, the 17-year-old Piaf gave birth to her daughter, Marcelle (nicknamed Cécelle) at the Hôpital Tenon. Like her mother, Piaf found it difficult to care for a child while living a life of the streets, as she had little maternal instinct, parenting knowledge, or domestic skills. She rapidly returned to street singing, until the summer of 1933, when she opened at Juan-les-Pins, Rue Pigalle. Following an intense quarrel over her behavior, Piaf left Louis Dupont (Marcelle’s father) taking Mômone and Marcelle with her. The three stayed at the Hôtel Au Clair de Lune, Rue André-Antoine. During this time, Marcelle was often left alone in the room while Piaf and Mômone were out on the streets or at the club singing. Dupont eventually came and took Marcelle away, saying that if Édith wanted the child, she must come home. Like her own mother, Piaf decided not to come home, though she did pay for childcare. Marcelle died of meningitis at age two. It is rumored that Piaf slept with a man to pay for Marcelle’s funeral. I was aware that she had a daughter that died, but never about the other things. Man, Piaf really went through the gamut of pain in her life. still never seen this after all this time. do u think ill like it? I think you’d find it interesting, particularly to see the transformative work from Marion Cotillard. I’d like to see what you made of it. It’s been a while since I’ve seen the film but it definitely made me aware of who Marion is and then realize she was in Big Fish. Since then, she’s one of my favorites as I’m waiting for her to do an American comedy that will play into her strengths. Marion Cotillard has become one of my favourite actresses in recent years. I’d love to see her in a comedy. I’ve never been familiar with French films but this one looks interesting. I’ll have to see if it’s available at the library. Good review, buddy! Naked hugs! I suggest it highly, especially for Cotillard’s towering performance. I haven’t seen this yet but will do. It’s well worth your time Fraggle. My sis loved her performance. She still raves about it. Nice review dude. Your is right to rave about her performance. If you love Marion, this film is for you. She literally transforms into Piaf majestically. Seems in keeping, then, ‘cos she’s damn majestic all the time. She really is a powerhouse performer. I love how deeply she invests her characters with emotion. There are four actresses who I believe do this impeccably; Cotillard obviously, Meryl Streep, Cate Blanchett and Julianne Moore. Agree with you about the pace and the non chorological narrative- I can’t say I enjoyed this for that reason. That and the gloomy outlook made it pretty hard to watch. Great review though! It is a painful and melancholy film, but I believe it captured the essence of Piaf’s tragedies well. And Cotillard completely blew me away with her award winning role. She lived and breathed the part. 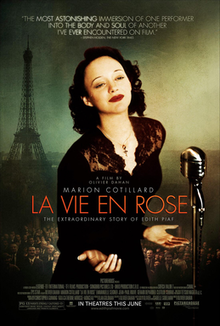 Oh shame on me for not seeing this movie … It’s just the kind of thing I am interested in: the time period, Paris, Marion Cotillard is a favorite and of course the story of Edith Piaf. Another excellent review, Vinnie. I must put this on my list! If you like all those things, this is the movie for you Meg. Marion Cotillard is astonishing. I can imagine. I think she’s a brilliant actress to begin with! Indeed she is, one of the best over the last few years. Like Meryl Streep, she disappears into the parts. Exactly, I take it you are a fan of Streep? I’m a big fan of her versatility. Though I still have many of her movies to see. I really love this movie. It’s been a while since I’ve seen it. I understand the issues with here and there narrative, but it worked for me. Once I understood that the narrative was supposed to be like a flurry of memories, it clicked well. A bit more coherence may have helped, but then it was still an absolutely mesmerising experience. And Marion Cotillard was so immersive. That ending, my God the hairs on the back of my neck stood up. Same here, I was crying so much too. That makes perfect sense Kim. It is a very tragic story, but Marion Cotillard brings it life so completely that’s it’s hard to look away.